DMRC Recruitment 2019 - Job notification for General Manager/Civil Post in DMRC, New Delhi on Deputation Basis. 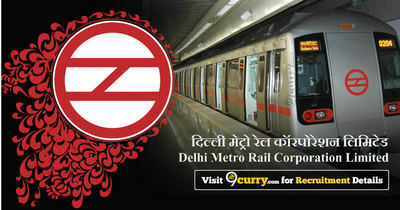 Applications are invited by Delhi Metro Rail Corporation Ltd, within 30 days from the date of issue for 2 vacancies. The officer should be working or empanelled in SAG level (Officers working in Non-Functional SAG may also apply). The officer should have varied experience of working in CPWD Civil/Construction department and should be conversant with functioning in a computerized environment. Hands-on knowledge of various computer applications, relating to the job is desirable. ₹37,400- 67,000 (Grade pay ₹10, 000 PB-4 as per 6th CPC) Level-14 in Pay Matrix as per 7th CPC. On the basis of Screening. Eligible candidates may send their application in prescribed format (attached below) to CGM (HR) Delhi Metro Rail Corporation Ltd Metro Bhawan Fire Brigade Lane, Barakhamba Road New Delhi. within 30 days from the date of issue, along with all relevant proof/documents in support of qualification, experience & pay scales/gross salary.